Expertly woven baskets, carved makalani kernels, stylish San ostrich-eggshell jewellery, richly dyed wild-silk scarves, Himba bracelets, attractive handmade paper, hand-woven carpets, striking textiles and brightly embroidered linen – this is the treasure trove of colour and craft found at the Namibia Crafts Centre. 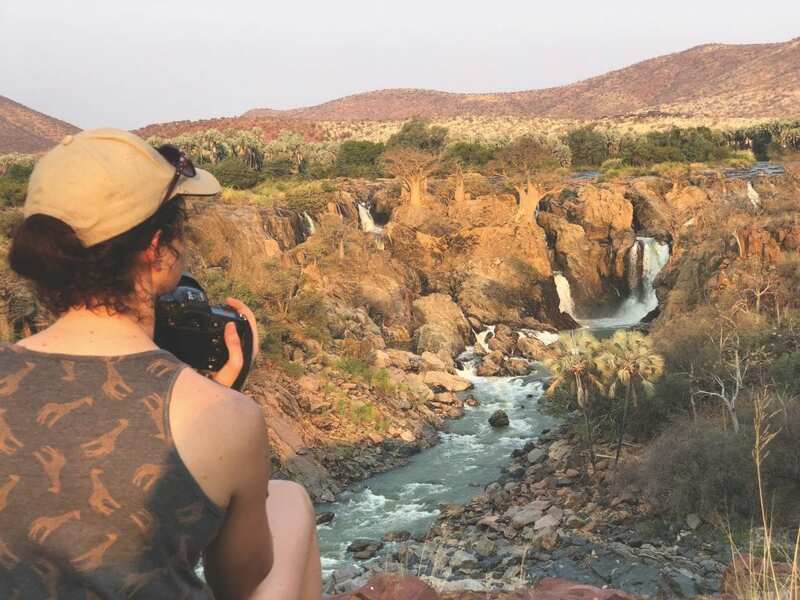 Humming with activity, the Centre houses a collection of Namibian items that epitomise the country – the character and essence of its intriguing cultures, its wide blue skies and endless landscapes, its wildlife and wonder. It’s Namibia, most conveniently, represented under one roof. After a good and fulfilling trip through the country, before the flight back home, visitors often have a few hours left in Windhoek to search for those special bits and pieces to take home for friends and family, and for items for themselves from areas they were unable to visit, as mementos of their experiences in the country of space and soul. If this is the case, the Namibia Craft Centre (NCC) is not to be missed. 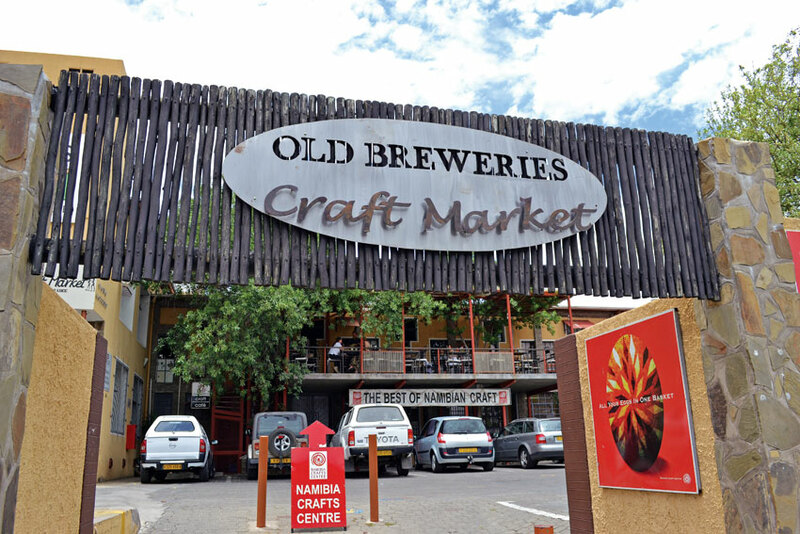 Centrally situated in Windhoek in the Old Breweries Building on Tal Street and offering plenty of enclosed parking, the NCC is easily accessible, also from Independence Avenue, for drivers as well as for pedestrians. For those in the family who don’t like shopping, the Craft Café provides a pleasant space to enjoy a meal or sip on a coffee while poring over a book on Namibia, or simply spend the last hours of sunshine on the outside deck. 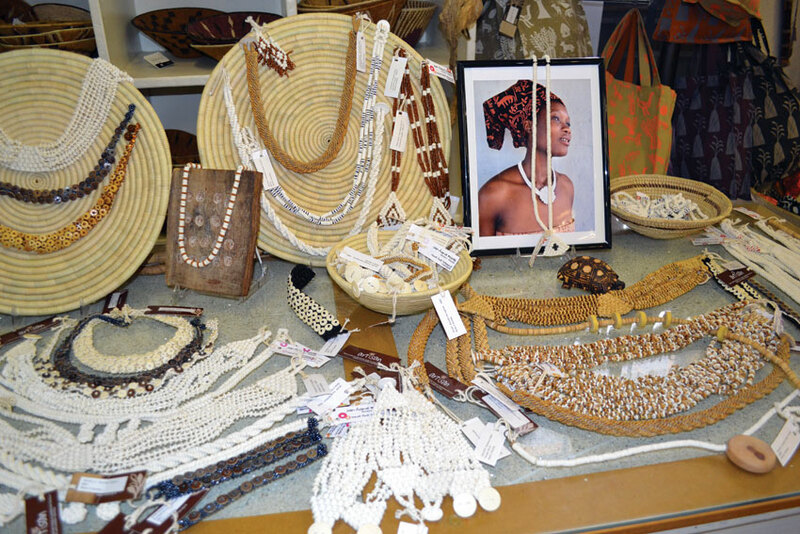 The NCC provides retail space to over thirty craft enterprises, many representing distinct communities, ethnic groups and specific projects, providing a platform for Namibian handicraft ranging from jewellery to enormous semi-carved tree roots. 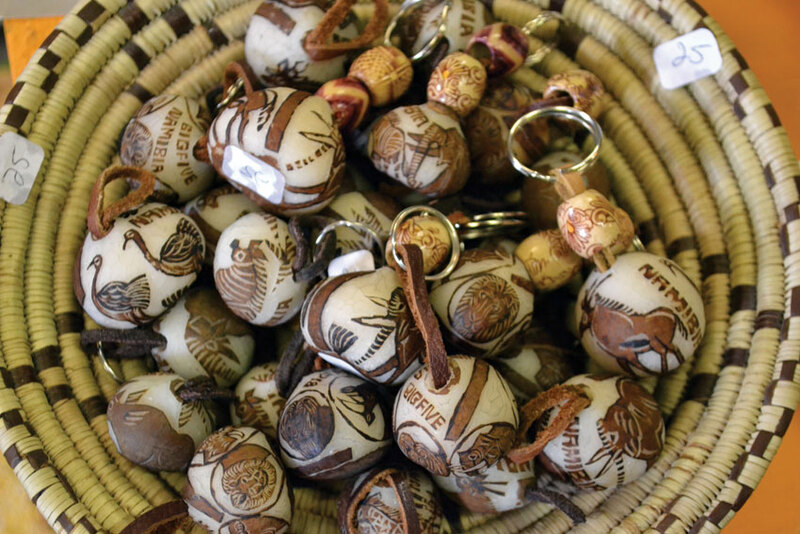 View the l­atest exhibition in the Omba Gallery, which showcase­s a wide range of art and crafts, from the exceptional finely woven basketwork hand-crafted in the Caprivi to the dazzling beaded Art-i-San products created by the San (Bushmen) in the Omaheke Region in eastern Namibia. On the top floor you can choose from a wide selection of Namibian books, music and photographs. If you explore these treasures, you will be charmed by the work. You can also discover the stories behind the crafts. On the bottom floor, look for the bright and endearing soft-toy animals (ideal gifts for the little ones), bags and jewellery made by Karas Huisen Crafts of Keetmanshoop, to support those infected with and affected by HIV/AIDS. Be sure not to miss the delights on the upper floor. The collection of crafts under the label of Mud Hut Trading, the marketing arm of Omba Arts Trust, assists small craft initiatives from different parts of the country in design and product development. 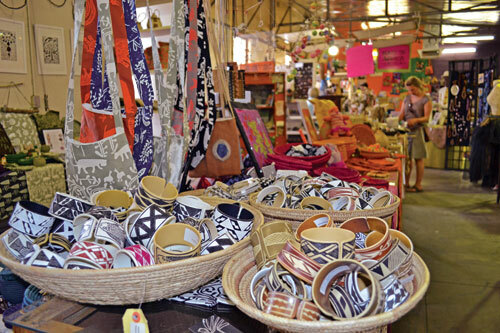 This section, crowned with 100% made-in-Namibia pro­ducts, offers a rich assortment of crafts, including basketwork from the north, glittering beaded bracelets from Art-i-San, the charming Ekoka Textiles, and products hand-made from mahangu, the staple grain in the north, under the auspices of the Onankali Omahangu Paper Project. 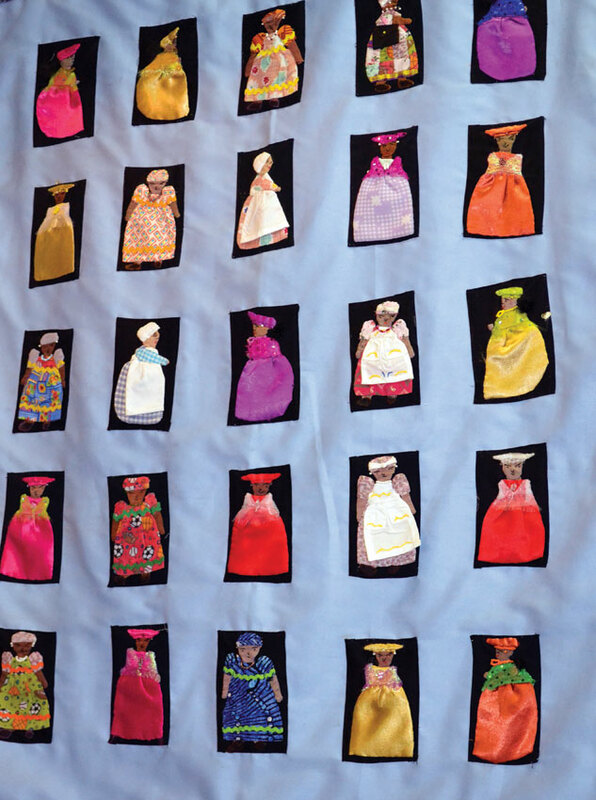 On this floor, you will also see the work of Ôasa Taradi, an embroidery and needlework group that began as a Namibia Red Cross project and was subsequently developed into an independent trust by the ‘busy women’, many of whom are sole supporters of large families. Maid in Africa occupies a vibrant corner, offering wacky clothing, postcards and coasters depicting Namibian life with colour and humour. Namibian flavours and remedies can be added to your shopping basket from the Craft Café shelves, such as a bottle of Kaktusfeigen Saft (sweet cactus juice) and devil’s-claw tea (especially from the Kalahari region). 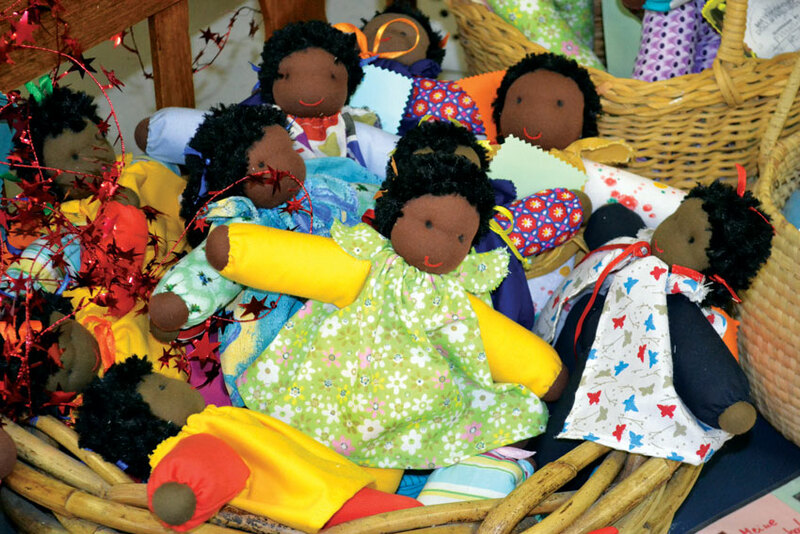 A few steps up are baskets of dolls made by the Matukondjo Doll Project, olive-oil soap produced in Ka­tutura, and the colourful embroidery work on cushion covers, pencil boxes and placemats by Penduka. Penduka was established in the 1980s as a self-help project to provide work for physically challenged, hearing-impaired and rural women. It is also involved in the provision of TB feeding schemes. 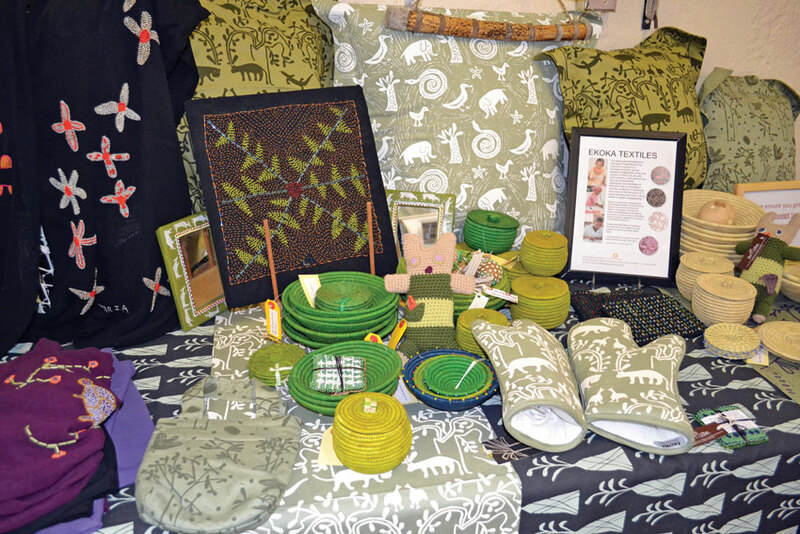 The Kalahari wild-silk outlet offers products hand-woven from silk thread collected and processed from the cocoons of the Gonometa postica moth. Regarded by cattle and game farmers as a serious threat to their domestic animals and game because, once ingested, the cocoons can cause rumen impaction that could lead to the death of the animal. In Namibia the conflict between wild-silk farmers and livestock farmers has all but disappeared due to the burgeoning wild-silk industry. Striking scarves, shawls and bedcovers are woven from the silk, providing employment in Leonardville, which lies on the fringe of the Kalahari. Don’t stop there. 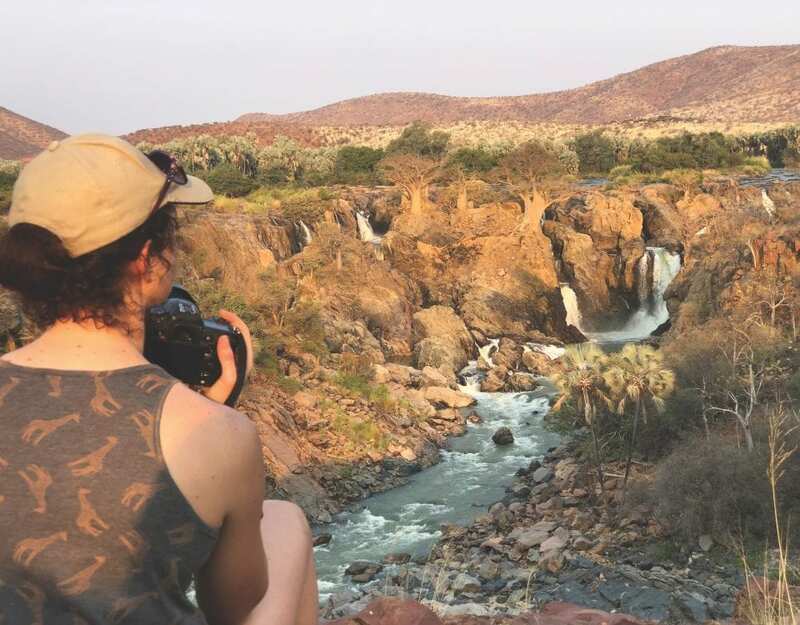 Continue out of the back entrance of the centre into the courtyard for a bite at Paul’s Coffee Shop and to visit the studio of well-known Namibian photographer, Tony Figueira. 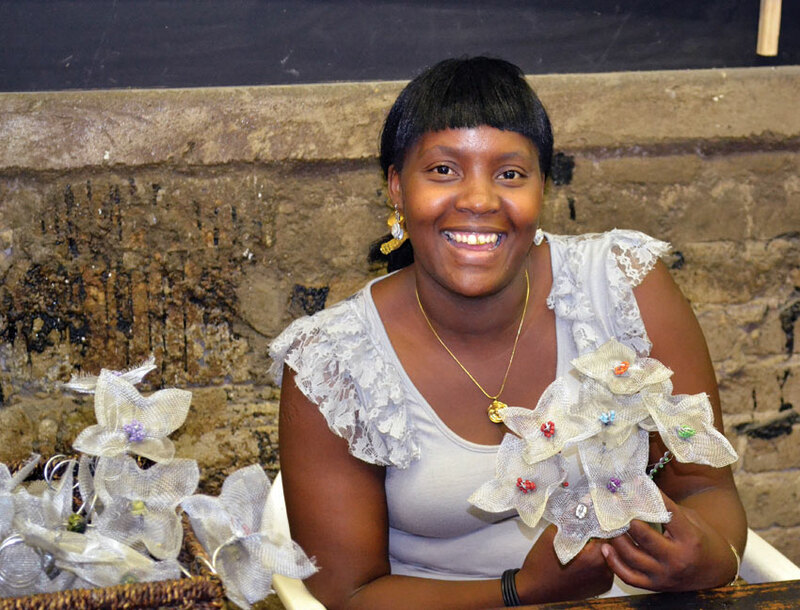 Amongst the colourful stories are also those of the ceramic beading and copper-wire group, Work of our Hands, originating at Vyfrand Kamp (Five Rand Camp) in Okahandja to give pride and dignity – as well as an income – to the women crafters; of the Victory Women’s Movement; of the embroidery farm project, Ikhoba; and of the Dinsdag (Tuesday) Daisies, a name devised by a group of women who met to paint on Tuesday afternoons, eventually compiling a birthday calendar for the Cancer Association. Something you may soon realise while walking around this intriguing centre is that besides the rich stories and golden opportunity of having access to goods that have been collected from all corners of Namibia and assembled under one roof, the words ‘craft’ and ‘art’ become intertwined. The time spent weaving a basket; threading cotton or beads to create a picture or a bracelet; carving a frame from wood; or making paper, is combined with the skill and talent of craftspeople countrywide to create striking works of art. Whether you walk out of the door with a postcard-sized photograph of a Himba woman, a basket or an embroidered pillow, you will probably have purchased a piece of art rather than just a souvenir, as well as gained a smidgen of Namibia to be cherished once you are home.